Unless you are a farmer, crop insurance might not seem like something that you should care about, right? Well if you like affordable fresh food, and knowing how your tax dollars are spent, you might just be interested in how basic crop insurance works. Want to collaborate? We’re looking for partners! What is Crop Insurance and Why Do We Need It? Crop insurance (CI) protects farmers against unexpected crop failures due to natural causes like hail, flooding, droughts, fire, frost, and wildlife as well as market fluctuations in commodity prices. It acts like a giant agricultural safety net for farm risk management. The basic types of CI are crop-yield, which insures actual losses based on yield (market-independent), and crop-revenue protection, which insures total revenue (may or may not be market dependent). Since it is very expensive to operate a farm, without crop protection policies a few bad weather years could put a farmer out of business and have long lasting effects on food production and food prices when farmers can’t get back on their feet. This was realized by the Canadian and American governments after the dust bowl drought of the dirty thirties put many farmers out of business and the nation starving. 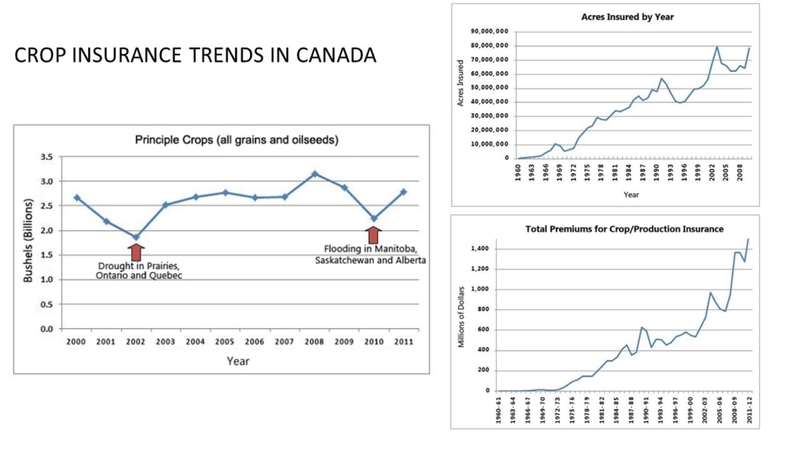 Since then, legislation such as the Federal Crop Insurance Act in the US (1938) and the Crop Insurance Act in Canada (previously the Prairie Farm Assistance Act 1939) has been in place to provide crop disaster relief through farm income stabilization. In Canada, this CI subsidy scheme has the federal governments contributing between 25% and 50% of premium costs and cost-sharing the administrative costs with the provincial governments, depending on the province. These federal payouts ranged between $150-$300 million per year in the 90’s when these numbers were last released. In the US the federal CI program cost between $2.5 – $14.5 billion per year, with the average annual cost increasing considerably over the last decade. Between 2004 and 2014 the US government spent $70 billion on crop insurance claims indemnities, premium subsidies, administrative and operational costs. An increasing rate of global climate change over the coming decades is expected to further increase these annual government expenses on CI programs due to increased frequency and new locations of intense droughts and severe storms bringing strong winds, lightining, floods, frost, freezing rain and the farmer’s dreaded enemy, hail. Crop insurance is not exactly a perfect system. Due to the diversity in agriculture operations (crop types, farming practices, land and soil resources) and both local and regional weather patterns it is a huge challenge to estimate insurance risk accurately and adjust premiums accordingly. In the beginning, low adoption rates left insufficient reserves for claim indemnity payouts. Thus over the past half century, crop insurance has seen its fair share of adversity. In response to frequent public discontent, CI policy and plans have continually evolved to offer options for all shapes and sizes of farming operations, as the old adage goes ‘one size does not fit all’. Policies have changed considerably in the past 30 years to make coverage more accessible for farmers and with that CI adoption rates have steadily increased to upwards of 80% of farmers in North America as well as for most modern nations. However, there are many farming communities with mandated premium payments that offer no returns to frustrated farmers year after year. On the other end of the spectrum, there are many farmers in the US and Canada that consistently get paid out more in indemnities than what their yield revenue should be. In fact the US Risk Management Agency (RMA) admitted that the CI industry has an exceptionally high level of fraudulent activity, reporting many cases of crop loss adjusters conspiring with farmers to report illegitimate claims for hundreds of thousands of dollars. The reason for such common insurance fraud with CI is that claims typically all occur at the same time of year for a region due to the fact that crop damage events and yield report validation workloads occur in big bursts across a given region, and the local crop adjusters become overwhelmed with enormous amounts of field inspection and paper work spread out over large and often remote areas of farmland. When a claim is submitted a crop adjuster must go to the farm to validate the claim by assessing the damage and estimating losses in crop yield. Depending on the number of adjuster an insurer has for a region it may take a few weeks or even months to get to a farm site when claim rates are high. In that time the farmer must leave the damaged crop for inspection and cannot put that land to good use until a claim is validated. These loss adjusting delays can result in lost productivity for the farm and long delays in claim payouts. 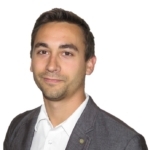 To combat these claims inspection and reporting overloads, there have been some recent efforts by both government bodies, like the RMA and insurance companies to use airborne and satellite imagery and online map databases for claims validation and fraud prevention, as a risk mitigation tool. 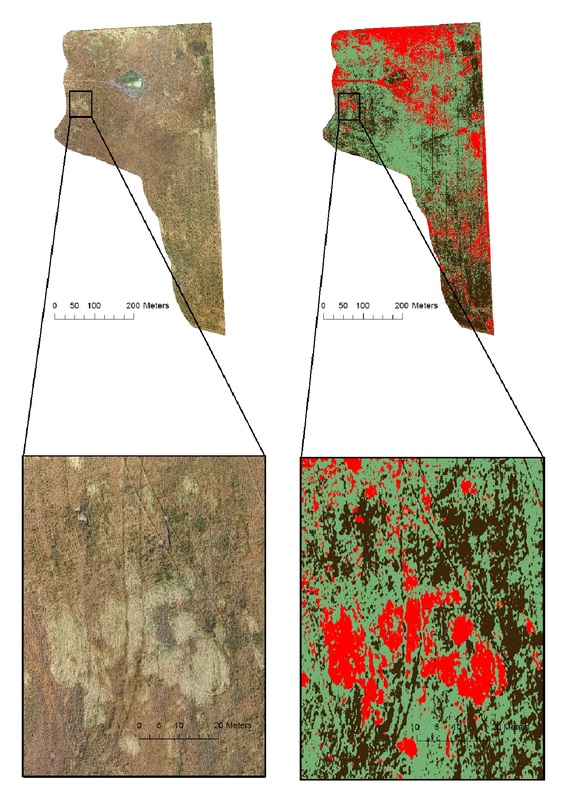 The challenge with airborne imagery is it is typically cost-prohibitive and untimely for most areas, as is high resolution up-to-date satellite imagery, and low-cost satellite imagery has too low spatial resolution to determine crop loss within a single field. Satellite imagery also suffers from frequent cloud contamination and other atmospheric interference for accurate crop loss assessment. At any given time roughly two thirds of our planets surface is covered by clouds. However, in recent years a new tool for ultra-high resolution imaging has emerged, one that is affordable, timely, and flies below the pesky cloud layer… and that of course is the small unmanned aerial vehicle, otherwise known as a consumer drone. With the recent rise of consumer drones, there has been renewed interest in remote sensing of crop performance and crop loss for affordable do-it-yourself precision agriculture. Now many farmers and some insurance companies are starting to use small drones for scouting crop problems. The caveat though is that proper remote sensing of crop health still requires a high level of knowledge of optical imaging systems, image analysis, and geographic information systems to obtain quantifiable information that can be used for commercial operations. With crop insurance for example, a farmer or crop adjuster may be able to fly a small drone to take some aerial photos of the field to eye-ball how much of a field has been flattened by a storm, but it will not tell you an exact area or percent damage of the crop in that area. This simple approach is already an advantage for farmers submitting damage claims or crop adjusters assessing yield losses since current methods for reporting this are at the mercy of the roadside perspective, but it does not quantify the crop loss across an entire field. TOP: Eye-level view of a wheat field two weeks after being hit with a powerful mid-summer storm. BOTTOM: Drone photo from 60m above the ground viewed at an angle showing flattened sections of the field that cannot be seen from the edge of the field. This view provides more insight than ground view but due to the oblique viewing perspective the area affected cannot be accurately measured using photometric tools. To quantify crop losses, a crop adjuster will walk the field and set up several small plots to determine percent plant damage and expected yield loss within those plots. For fields that are hundreds of acres, or farms that are thousands of acres in size, a thorough crop loss inspection can take a full day or more of manual assessment, and even then, not every acre of a given field can be inspected. If the crop damage appears to be uniform, the adjuster then extrapolates that percent loss calculated in the sample plots to the entire field. If the damage is not even across a field, which is often the case (especially with hail and wind), they then have the difficult task of figuring out what percentage of the field was affected by the storm, as well as degree of damage in the affected areas to determine a total percent crop loss for the field. For the sake of simplicity, damage estimates often need to be binned into broad damage categories of 25% intervals to provide an educated guess at overall expected losses. While an experienced adjuster may be really skilled at estimating how much yield has been lost in a sample plot, they have no way to examine every acre of a field and thus have to rely on their expertise and any information they get from the farmer in order to judge the losses across a larger area than they can physically inspect. This makes the process of large field assessment somewhat subjective, especially when the whole field in not easily within eye-level line of sight. When adjusters are burdened with hundreds of claims at all at once they must further rely on their quick assessment judgement in order to avoid falling behind the workload that piles up at busy times of the year. Thus, in areas hit hard by summer storms, with large, inaccessible expanses of field, the process of sample plot extrapolation can result in significant over or under estimations of damaged areas of crop. The resulting insurance claim payout might be inaccurate by only a few percent or it may be off by much more depending on the size and accessibility of the field, but on a crop insured at $100/acre for example, even 5% damage extent error over a 5,000 acre farm can result in a huge discrepancy in your claim. While this method of crop loss adjusting has worked fairly well for insurance providers in the long run based on the law of averages – maybe overpay here and underpay there, adjust the premiums and it all evens out – we now have the technology to bring crop loss adjusting sciences into the 21st century to help address such challenges that farmers, insurers and crop adjusters face on a regular basis. Using programmable unmanned aerial vehicles equipped with digital cameras it is possible to rapidly capture ultra-high definition maps (1-5 cm resolution), called orthomaps, of large fields quickly and easily. At Skymatics, our pilots are capable of imaging a full quarter section of land (160 acres) in 20 minutes of flying time and generating maps the same day that reveal exactly how much crop area has been damaged and to what extent. We are currently working with insurers to determine how those damage maps relate to yield losses so that we can automate the process of reporting lost yield potential based on a quick drone flight over a field. Ultra-high definition UAV orthophoto of the same field seen in the previous figure (made from 650 nadir-view photos). Mapping the full field from stitched together drone photos reveals the damaged sections of the field down to 3cm resolution. The area mapped in red quantifies the crop damage from a storm down to the square meter providing absolute certainty to insurers and farmers that their crop insurance claim is accurate and fair. We at Skymatics are pushing the envelope of what is possible with drone technology. We have been mapping farms with drones for years using cutting edge aerial imaging capture and processing technology to deliver ultra-high resolution maps (5cm pixels or less) to farmers, agronomists, and precision ag firms for better decision making and farm productivity management. 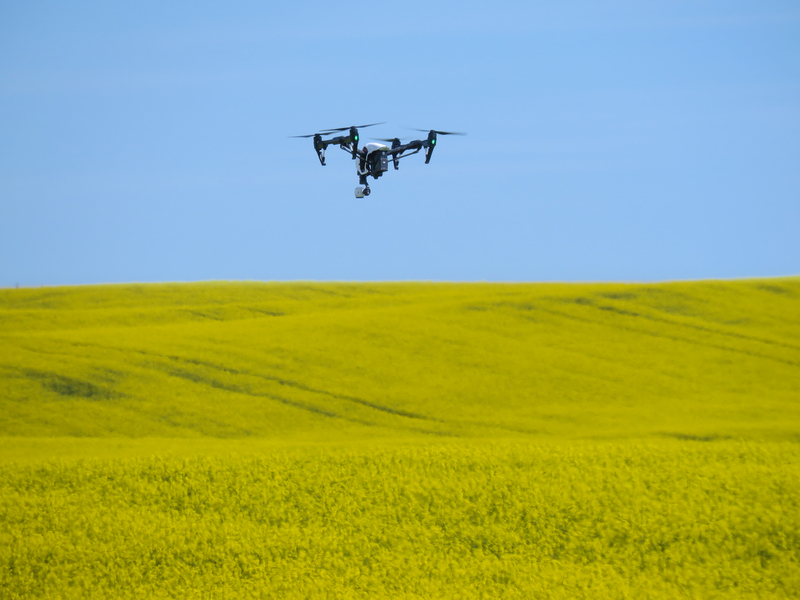 We know what drones are capable of for crop insurance and have been working tirelessly to bring drone tech to precision crop adjusting practices. 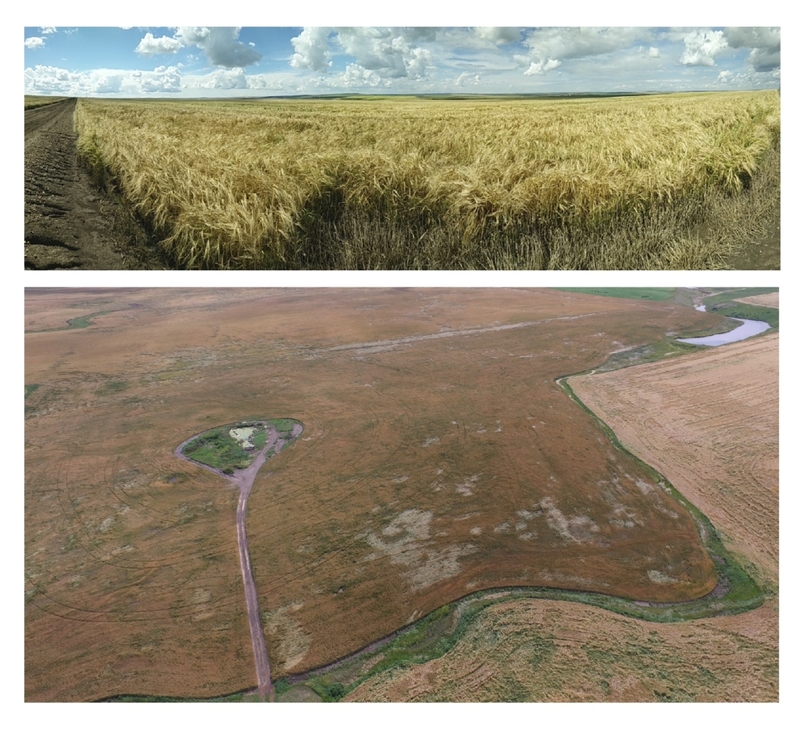 Based out of Calgary, Alberta Skymatics has just launched a province-wide campaign called SkyClaim (backed by the Government of Canada’s geomatics technology investors group Tecterra) to collect drone map imagery of recently damaged crops for our custom analytics project aimed at making crop adjusting with drones a fast, cost-effective, and accurate crop loss assessment tool in the farmers arsenal against severe weather risk management. We have already developed a workflow that enables rapid delineation of crop hail, flood, and fire damage from drone map imagery that we collect and advanced image analytics, but we want every farmer and crop adjuster to be able to do this from their smartphone. In order to create a mobile application for anyone with a drone to map and report crop damage insurance claims, and for adjuster to quickly and accurately estimate losses over hundreds of acres of farmland we require even more imagery to help create a universally applicable mobile app.